With the headlights on, push the lever away from you to turn on the high beams. 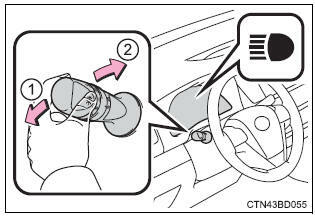 Pull the lever toward you to the center position to turn the high beams off. Pull the lever toward you and release it to flash the high beams once. You can flash the high beams with the headlights on or off. Type a: to make your vehicle more visible to other drivers, the headlights turn on automatically (at a reduced intensity) whenever the engine is started and the parking brake is released. Daytime running lights are not designed for use at night. For the u.S.A.: Daytime running lights can be turned off by operating the switch. Type b: to make your vehicle more visible to other drivers, the daytime running lights turn on automatically whenever the engine is started and the parking brake is released. Daytime running lights are not designed for use at night. Compared to turning on the headlights, the daytime running light system offers greater durability and consumes less electricity, so it can help improve fuel economy. The sensor may not function properly if an object is placed on the sensor, or anything that blocks the sensor is affixed to the windshield. Doing so interferes with the sensor detecting the level of ambient light and may cause the automatic headlight system to malfunction. When only the tail lights are on: the tail lights turn off automatically if the engine switch is turned to the "acc" or "lock" position and the driver's door is opened. If any of the doors is kept open, the lights automatically turn off after 20 minutes. When only the tail lights are on: the tail lights turn off automatically if the engine switch is turned to accessory mode or turned off and the driver's door is opened. Vehicles without a smart key system a buzzer sounds when the engine switch is turned to the "lock" or "acc" position and the driver's door is opened while the lights are turned on. vehicles with a smart key system a buzzer sounds when the engine switch is turned off or turned to accessory mode and the driver's door is opened while the lights are turned on. the headlights and/or tail lights are on. Vehicles without a smart key system: the engine switch is turned to the "acc" or "lock" position. Vehicles with a smart key system: the engine switch is turned to accessory mode or turned off. vehicles without a smart key system: when the engine switch is turned to the "on" position. Vehicles with a smart key system: when the engine switch is turned to ignition on mode. When the light switch is operated. When any of the doors is opened or closed. Settings (e.G. Light sensor sensitivity) can be changed. Do not leave the lights on longer than necessary when the engine is not running.